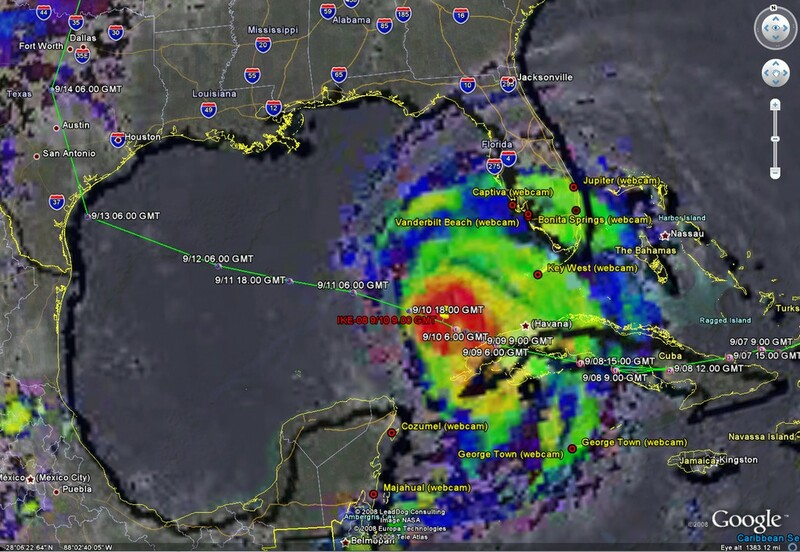 Satellite image of Hurricane Ike and its predicted path as of Wednesday morning. Click for larger image. The Texas coastline is preparing for a potentially devastating strike from Hurricane Ike this weekend as the storm regains strength. 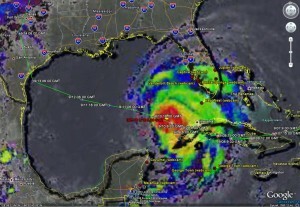 The center of the storm is currently 145 north of the western tip of Cuba and moving toward the northwest at 8 mph. Ike’s interaction with land near Cuba took a lot out of it as it dropped to a category 1 hurricane with sustained winds of 85 mph. 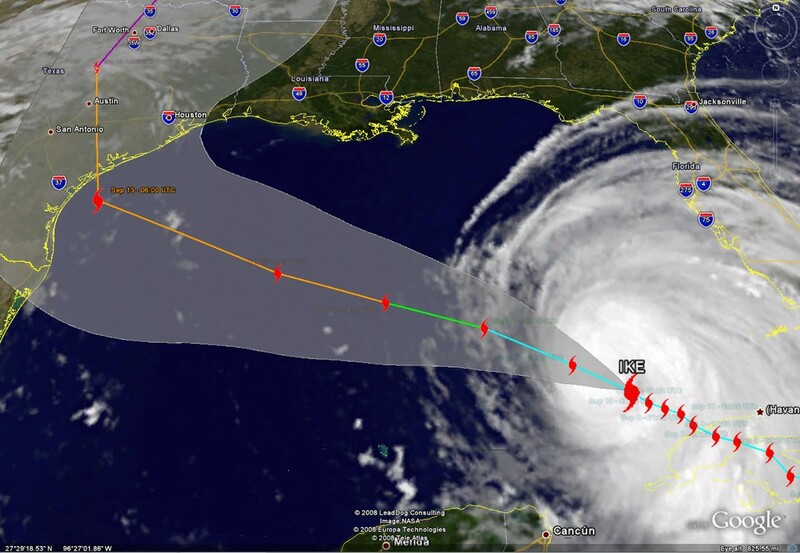 However, the storm is expected to fully recover and regain strength as it crosses the Gulf of Mexico, possibly becoming a category 3 storm by the time it makes landfall. Current modeling indicates the storm is headed for a collision course with land Friday night striking between Corpus Christi and Port Lavaca, Texas. All residents from northern Mexico to those on the northern Texas coastline should begin making preparations for the storm immediately. As the storm regains strength, it is expected to gain in size as well and will most likely impact Houston and Brownsville as well. Residents should review their emergency plans and absolutely not hesitate if advised to evacuate by emergency officials. Spectral image of Hurricane Ike as of Wednesday morning. Click for larger image. Texas Governor Rick Perry began preparations for a potential major hit from the storm and emergency assets are being prepositioned should they be needed. Some people with special medical needs will begin evacuating inland Wednesday and the pace and number of evacuations will increase as the storm nears and the path becomes more clear. For the latest on the storm’s location, please visit the ThorntonWeather.com Hurricane Tracker. This entry was posted on Wednesday, September 10th, 2008 at 6:27am MDT and is filed under National Weather. You can follow any responses to this entry through the RSS 2.0 feed. You can skip to the end and leave a response. Pinging is currently not allowed.